Powers/Abilities: The Wendigo possesses sharp teeth and claws, and an appetite for human flesh. Its body is said to be made of ice. It seems to come and go with winter weather, and emits a loud howl as it closes in on its prey. History: (Amazing Spider-Man I#277/2 (fb) - BTS) - The Wendigo is said to be a spirit from Canada which would devour people found lying in the snow. (Amazing Spider-Man I#277/2) - During a blizzard, the Wendigo traveled into New York City, and came upon Spider-Man as he was aiding a child in escaping from her captors. 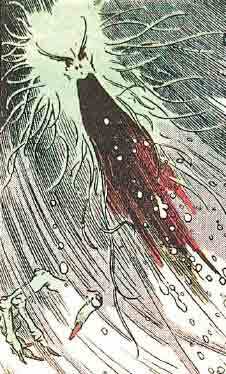 The child had heard stories of the Wendigo from her mother, and recognized it howling in the snow. Unseen by Spider-Man, the Wendigo attacked one of the gunmen who had kidnapped the child, and apparently killed him. The Wendigo departed New York City as the blizzard ended. 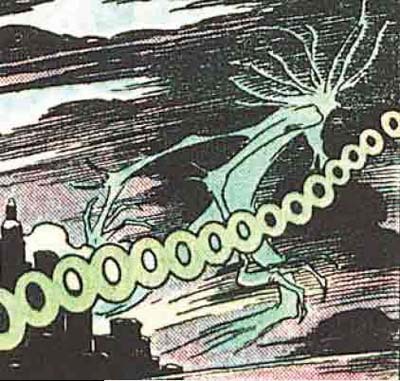 It's possible that this creature is the same entity seen in other Marvel comics, but is the actual Wendigo spirit of Algonquin legends (as opposed to all those Wendigos who were hosts to it). The Askwith's were a family from Canada who moved to the United States. Mrs. Askwith told her daughter many stories of the Wendigo, to the point where the child believed that the Wendigo had followed them from Canada to the United States. Mr. Askwith was a Canadian politician, and this resulted in his daughter being kidnapped and held for ransom. She was saved from her kidnappers by Spider-Man.